New Jersey Search and Rescue is always looking for new members, and while we train all candidates in many disciplines of search and rescue, we always welcome qualified members of law enforcement, fire, EMS and other rescue organizations who come with search and rescue experience. Those with skill in navigation, wilderness survival, patient care, radio communications, K-9 handling, incident management or technology are encouraged to attend an orientation and meet the team. Of course, a passion for the outdoors is a highly desirable trait for all candidates. 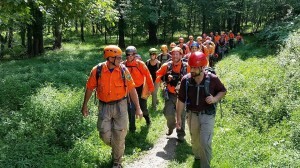 We provide several months of in-house training that includes search techniques, patient evacuation, map-and-compass navigation, CPR, wilderness first aid and bloodborne pathogens. Every candidate must complete an overnight wilderness survival skills drill. 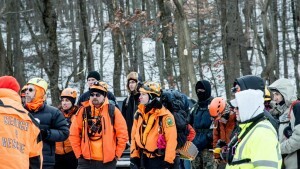 After all requirements are complete, mission ready candidates are permitted to attend searches under the guidance of more experienced members of New Jersey Search and Rescue. All candidates and members must attend one evening meeting and one full-day drill each month. Those who choose to join our specialized Mountain Rescue, Incident Management, Medical and K-9 Units must also attend additional unit trainings. All members are on call for searches 24/7/365, but can always prioritize the demands of work and family as appropriate. New Jersey Search and Rescue is a 501(c)3 organization and all its members are unpaid volunteers. While the team has a variety of gear essential to search and rescue, all volunteers must purchase their personal gear and uniform. They also incur some nominal training expenses. The equipment can be acquired over time and the more experienced members are always eager to make suggestions on the many gear choices. Please do not purchase any gear before beginning your training. To join New Jersey Search and Rescue, please Contact Us and let us know that you are interested, then attend our next monthly meeting. Meetings are generally held on the first Wednesday of every month and the full-day drill is held on the following weekend. For membership inquiries, including if interested in any of the units like K9, Medical, or MRU, Choose “Membership” on the Contact Us page to send the inquiry. Copyright © 1987-2018 New Jersey Search and Rescue®, Inc.